If only I had time is an expression I hear constantly. People will say to me, “Oh I’d love to do that, if only I had the time.” However we all have the same amount of time. We all have 168 hours each week and it all comes down to how we make best use of it. Time is the most precious commodity and far too many people don’t use their time as wisely as they should. 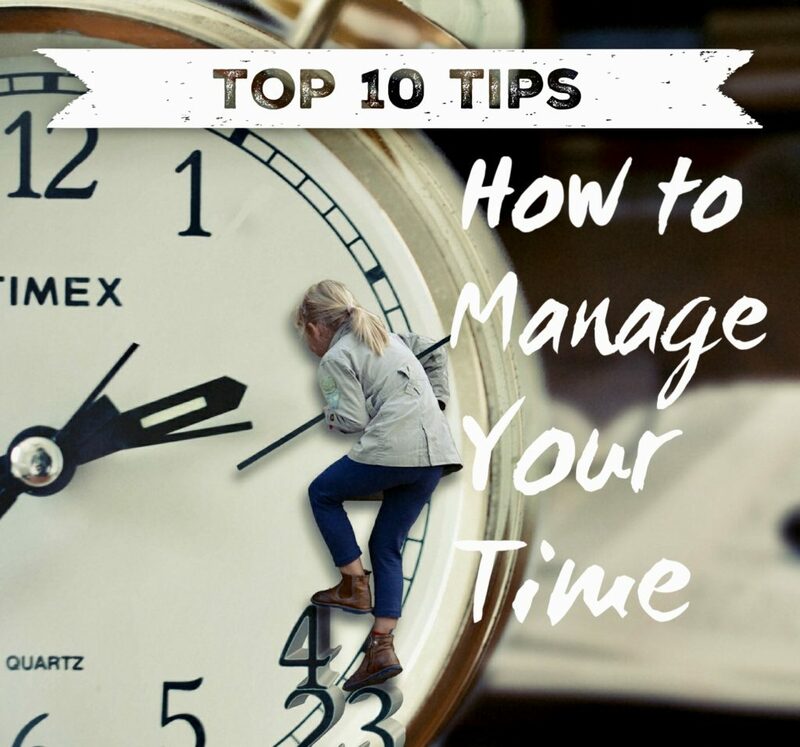 So here are my Top 10 tips for how to manage your time. 2. Keep your life and your desk free of clutter: Dealing with clutter just stresses you out, so be ruthless and get rid of it. You cannot work efficiently at a desk which is full of clutter. And you will waste so much time looking for things you need. So clear your desk and get rid of anything in your life that will prevent you from managing your time as efficiently as possible. 3. Be organized: A place for everything and everything in its place. If everything is in its place then you’ll know where to find it should you need it. And that reduces clutter and makes for a better environment in which to work, be it in the workplace or your personal life. 4. Make lists: You need to plan your week and plan each day too. Write it all down so you won’t forget it. Having a weekly planner is a good idea. Knowing what needs to be achieved each week, allows you to identify ‘must do’ activities each day. At the end of each day make a list of what needs to be done the next day in order to achieve your objectives. And do not rest until your list has been completed each day. 5. Prioritize: Everything is urgent these days, so you have to identify those things that are important to you achieving your objectives. Those are then the activities on which you must focus. You should know your priorities and they are the things that will allow you to achieve your objectives and meet your deadlines. 6. Develop routines: Having a proper routine will allow you to get very efficient at what you do. For instance, rather than responding to emails as and when they arrive in your inbox, set aside two or three time windows each day when you will deal with email. That could be for exactly one hour at the beginning of each day; half an hour just before lunch and then say half an hour at the end of the day just before you leave your desk. Be very strict about these windows for dealing with email and don’t allow email to become a distraction at other times. 7. Set deadlines and stick to them: If you have a piece of work to complete, judge how long it will take, use that to set a deadline for completion and then focus on that work such that you complete it within your deadline. 8. Delegate whenever possible: You should only be doing those things which absolutely have to be done by you. If you are lucky enough to have people to whom you can delegate then make use of them as much as you possibly can. 9. Don’t procrastinate: Procrastination is the thief of time. If you have got something to do, then get on with it. Don’t mess around. The sooner you start the sooner you will finish. 10. Learn to say No: Master this skill and it is the biggest time saver of them all. Far too often we agree do something for someone else simply because we don’t like saying no. It may not even be our responsibility but we do it anyway rather than say no. Always be polite but it is perfectly reasonable to say, I’d love to help you but I am busy right now. Whilst this is not a comprehensive list, it is a good basis on which to start improving your time management. If you want to be successful then time management is an essential skill. So dear reader, was this post worth a little piece of your time? If so, please share it with your friends on social media. When you share, everyone wins. If you knew you’ll die tomorrow, here’s what’s important to you today?